hotel sympa ... hotel sympathique a recommander sur hanoi. tres propre, bien situe, personnel tres accueillant. Situated at No 22 Tho Xuong-a very quiet street(next to Au Trieu Street and Viet Duc Hospital), just 20 meters from the front steps of St Joseph's Catheral in the center of town. Just a minute from the hotel you will see the beautiful Catheral which attracts many tourists all year around especially at Christmas . Thotel is a 3 minute walk from Hoan Kiem lake with a romantic feel to it. 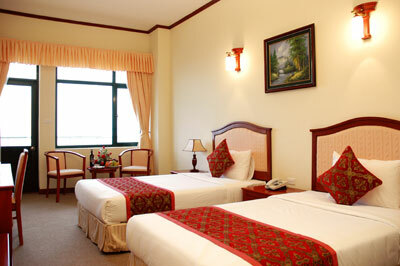 At Hanoi G/P hotel guest will enjoy a luxurious stay with many modern facilities . You will be taken care of by a team of dedicated and professional staff. The all inclusive price intitles you to breakfast, all day tea/coffee, fruit and welcoming fresh flower . For those of you just passing through we offer a transit stop so you can securely store you pack while you wonder arround Hanoi and grab a shower before leaving on night trains for Sapa, Hue, Hoi An.... and buses for other exciting destinations. Retreat from the daily hustle and bustle of HANOI indulge yourselves in the exclusive tranquility and luxury of your stay at our Hanoi Golden Plaza Hotel which meets all your needs. Thank you for your attention at Hanoi Golden Plaza Hotel. We would like to give you some infomation about our hotel. Situated in the Old Quater and bounded by a commercial centre, Hanoi Golden Plaza Hotel is one of the most beautiful and luxurious hotels in the city. 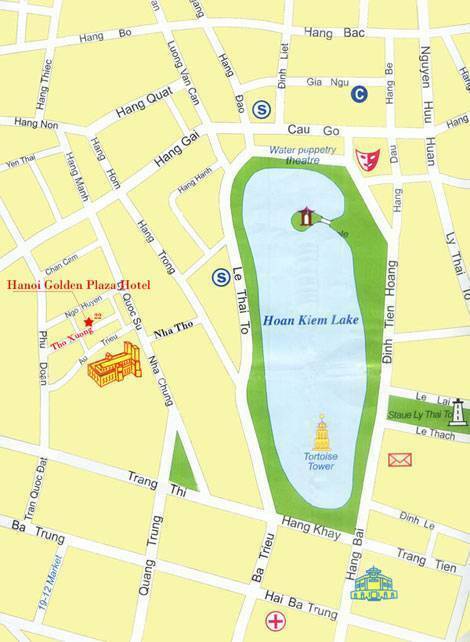 The ancient and romantic Hoan Kiem lake is just a three minute walk from the hotel. The hotel is six storeys with 20 international Deluxe rooms. the rooms have spacious balconies and the most and elegant facilities. Most of the rooms have a bath tub, heating, air - conditioning, international satellite TV, a fridge with several kinds of soft drink, a wardrobe, a coffee table, a desk and other facilities. The rooms have a FREE ADSL Internet (fast internet) connection. The well-trained and skillfull staff will give you a high quality of service and help you feel comfortable and happy during your stay in Hanoi . We have 3 kinds of room. The roomrate is: (double for each kind of room). The roomrate includes breakfast and fresh fruit. If your stay with us is long we will pick you up from airport for free and the price of a room will be reduced. The hotel is six storeys the rooms have spacious balconies and the most and elegant facilities. Most of the rooms have a bath tub, heating, air - conditioning, international satellite TV, a fridge with several kinds of soft drink, a wardrobe, a coffee table, a desk and other facilities. The rooms have a FREE ADSL Internet (fast internet) connection. Thank you for your attention at Hanoi Golden Plaza Hotel. We would like to give you some infomation about our hotel. Situated in the Old Quater and bounded by a commercial centre, Hanoi Golden Plaza Hotel is one of the most beautiful and luxurious hotels in the city. The ancient and romantic Hoan Kiem lake is just a three minute walk from the hotel. The hotel is six storeys the rooms have spacious balconies and the most and elegant facilities. Most of the rooms have a bath tub, heating, air - conditioning, international satellite TV, a fridge with several kinds of soft drink, a wardrobe, a coffee table, a desk and other facilities. The rooms have a FREE ADSL Internet (fast internet) connection. The well-trained and skillfull staff will give you a high quality of service and help you feel comfortable and happy during your stay in Hanoi . We have 3 kinds of room. The roomrate is: (double for each kind of room). The roomrate includes breakfast and fresh fruit. We look forward to hearing from you soon. If your stay with us is long, the price of a room will be reduced. Free airport pick up if book from 03nights up for deluxe, family and VIP room Free airport pick up by sharing minibus for all rooms types. Situated down a small, quiet lane called Tho Xuong just a few steps to the St Joseph's Cathedral(Nha Tho Lon in vietnamese) in the centre of town and 3 minutes walk to Hoan Kiem Lake. 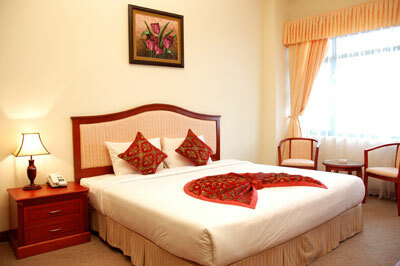 The hotel is perfectly located to explore Hanoi's Old Quarter. of Hanoi. Airport shuttles ($3USD/person) and taxis ($16-$20USD) are available from the arrivals terminal. A hassle free airport transfer can be arranged from as little as $20USD for a 4 seat car or $25US for a larger 7 seat people mover. To have us arrange a driver to meet you when you arrive at Hanoi International Airport use the contact form to the right to send your flight details. In fact the Hanoi Golden Plaza is situated on a narrow lane for shuttle buses and taxis to drive down. So if the shuttle bus or taxi stops directly outside a hotel you have been taken to the wrong address. Location: Situated down a small, quiet lane called Tho Xuong just a few steps to the St Joseph's Cathedral(Nha Tho Lon in vietnamese) in the centre of town and 3 minutes walk to Hoan Kiem Lake. 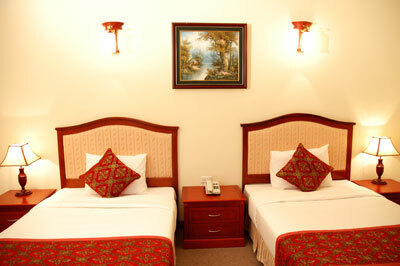 The hotel is perfectly located to explore Hanoi's Old Quarter.